The Architectural Heritage Fund was proud to support the Social Enterprise NI Gala Awards, which took place in The Stormont Hotel. The increasingly popular awards, attended by over 400 guests, representing the social enterprise, private and public sectors (an increase of 100 on last year), help to showcase the burgeoning social enterprise sector in Northern Ireland. Over 100 entries were assessed for the 13 categories, and award-winners include the impressive NOW Group, which is currently working with an existing AHF client to explore working in partnership to revive a Grade A building at risk. Clanmil Housing Group won Housing Association of the Year, and its Heritage Division is to be applauded for its recent restoration of Rosetta Cottages in Belfast, with support from the AHF and the Department for Communities’ Historic Environment Division. The Local Council of the Year award went to Lisburn and Castlereagh City Council, who are heavily involved in supporting the re-use of the Navigation House stables to create the Waterways College. Lagan Navigation Trust benefited from a Project Viability Grant from the AHF to help demonstrate the latent demand for the College, and the Council’s commitment to work with the Trust, and others, to unlock the potential of the Lagan River and its associated natural and built heritage is to be applauded. 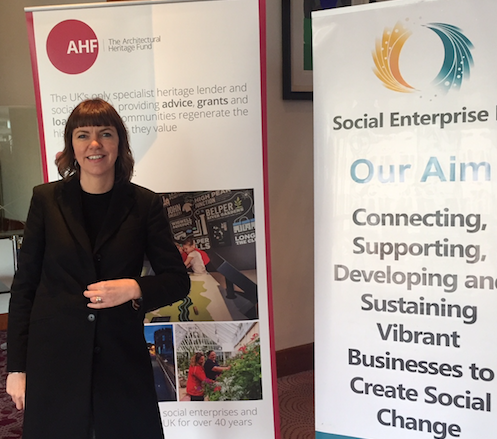 AHF offers its congratulations to all those who won or were nominated for awards, and, indeed, to all those who are involved in doing good business in the impressive social enterprise arena, which is evidently going from strength to strength.